What are the Credit Requirements for Buying a Car? Roughly 6.3 million people purchased a car in the United States in 2017. If you’re ready to buy your first car or think it’s time to upgrade, do you know if your credit will make the grade? In this article, we’ll look at the credit requirements to buy a car, what to expect when financing a car, and what you can do if you need to improve your score. If you’ve ever worried that your credit score would prevent you from being able to buy a car, you’re not alone. Buying a car, like purchasing a home, can often feel overwhelming and foreign —especially if you’ve never made a purchase of that size before. 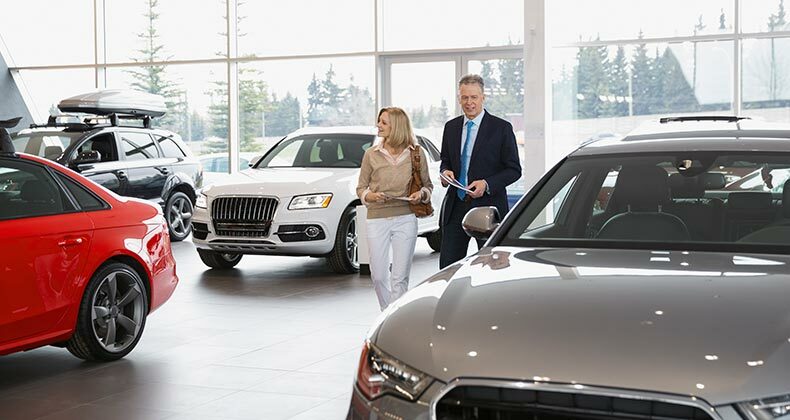 While car dealers will often do whatever they can to work with your credit, a higher score will almost certainly help you land a lower interest rate and better loan terms. In 2017, the average credit score for a new car loan was 721, and for a used car loan it was 641. When you consider that the average credit score among Americans is nearly 700, it’s easy to see why your credit score —and understanding it— is so important to the car buying process. Why is it important to understand the credit requirements to buy a car? 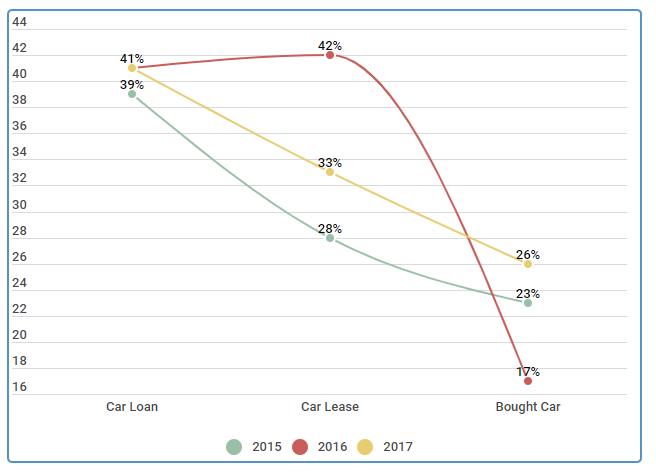 With the number of American adults financing the car they are currently driving through a car loan on the rise (41% in 2017 vs 39% in 2015), it’s clear that it’s important to understand the credit requirements to purchase a car. It’s a good idea to have some knowledge of what dealers will see when they check your credit score and your credit profile. Knowledge is power, so knowing what’s in your credit report, along with the credit requirements to buy a car, will help you make smart purchasing decisions at the dealership. Source: Credit Sesame followed 1000 Members for three years documenting their choices for automobile financing and purchasing decisions. The poll was conducted from January 2015 until December of 2017. 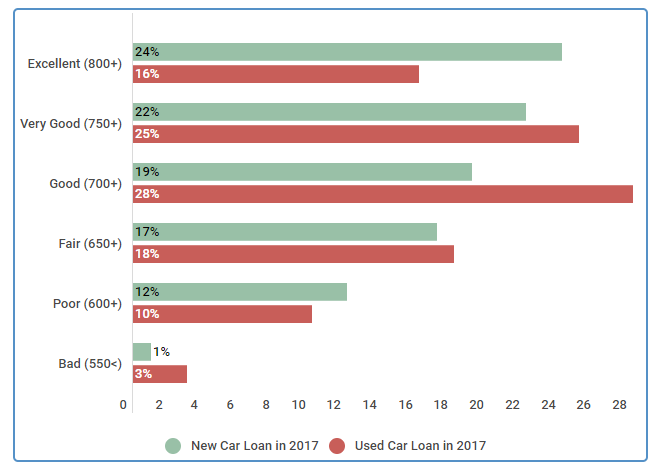 Let’s take a look at both new and used car loans in 2017, and see how they were distributed among the credit score ranges. 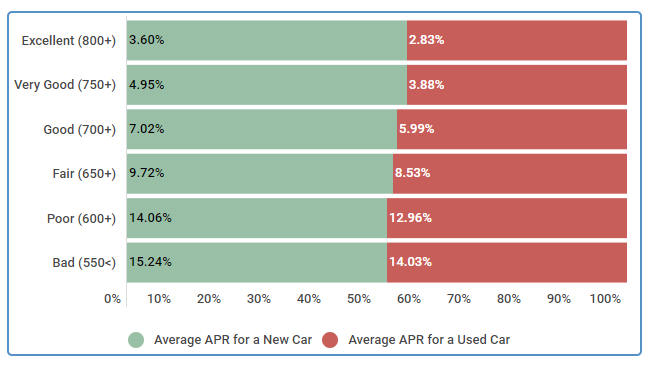 As you can see below, the approval numbers drop as the credit scores do — meaning that if you’re in the market to buy a car, it pays to get your credit in shape first. Source: Credit Sesame followed 600 Members in 2017 documenting their choices for automobile financing and purchasing decisions and were divided by FICO Credit Score Ranking. The poll was conducted from January 2017 until December of 2017. Your ability to get the loan isn’t the only way that your credit score impacts a car deal. It also directly impacts the interest rate that you will receive. Let’s look at just how much impact it has. As mentioned, your credit score directly impacts the interest rate you will get for your car loan. Someone with a credit score in the mid-700s might see a rate on a used car of around five percent. Someone with a score in the mid-500s? That rate can easily triple. Not only does this mean a higher monthly payment, but it also means that you’ll end up paying much more for the same car, in the long run. And, to make things more interesting, a low score can also mean you’ll end up paying more for your car insurance, too. We surveyed Credit Sesame members to see what rates they were quoted for new and used car loans. As you can see below, rates are significantly lower for those with good and excellent credit. As credit scores fall into the poor and bad ranges, rates can skyrocket to over 12%. Source: Credit Sesame followed 600 Members in 2017 documenting the quoted rates for automobile financing and purchasing decisions and were divided by FICO Credit Score Ranking. The poll was conducted from January 2017 until December of 2017. So what should you do if your score isn’t what you’d like? Let’s take a look at some of the most common strategies for improving your credit. If your credit score is less than stellar, you’ll need to make some extra preparations before heading to the car dealership. Be prepared for the lender to have questions about any negative marks on your credit report, and bring anything you need to prove or document the answers you provide. Although it’s possible to get a loan with a mediocre credit score, anything under 550 is typically considered a big red flag for lenders. While this means you won’t qualify for the best auto loan, it doesn’t mean that you can’t get a car. Reduce your balances — When you make a large payment or reduce your balances, you’re improving your Credit Utilization (how much debt you have versus how much credit you have available to you), which can improve your score in just 30-days. Correct any errors — Take a look at your credit report (you can request a free copy every year from each credit bureau) and make sure there are no factual errors on the report. If there are, you can dispute them with the bureau. Once resolved, these can have an immediate positive impact on your score. Become an authorized user — If you have a parent or someone you trust who is willing to make you an authorized user on their credit card, this can also have a positive impact on your score. For more strategies on how to improve your credit score quickly, check out this recent article. We interviewed David on October 20, 2018; he earns $68,000 a year is 44 years old and lives in Atlanta, Georgia. He is married with two kids and is working as a Licensed Clinical Social Worker. My credit score is 678. My wife and I got pregnant with our second child while I was studying for my Master’s degree. We weren’t financially prepared for another addition to our family, but we’re happy our family is growing. We made a few hard, financial decisions while I was in school, but we’re slowly improving both our credit scores. What kind of loan terms did you get with your score? I’d been driving my old Volvo for nearly 15 years when it died for the last time. I was doing home-visits for my patients at the time and my wife was taking care of our kids. We needed a second car and fast. I shopped around and the best deal I found was with a local, used car dealership. I got a certified pre-owned 2014 Honda RAV4 for $12,800 spread over 60 months. The best the dealership could offer me as an interest rate was 6.21%. I realize I’m paying a lot more to have a car now, but I couldn’t do my job without a vehicle. However, a new car financing was almost double that 10.03% and the dealership couldn’t guarantee my approval anyway. Would you recommend it for someone with similar credit? No, it’s not in a person’s best interest to purchase a car with credit like mine, which was 678. You’ll pay a lot more for the same car and in the end, they’re not worth that much. If I didn’t need a car immediately for work I would’ve improved my credit score as much as possible before buying a new car loan. It’s expensive to have a mediocre credit score. David’s story is important because it reminds us that there are steps you can take to secure financing, even if your credit is less than perfect. He points out, though, that he would have preferred to improve his credit score as much as possible before applying for a car loan. Now that you know more about the credit requirements needed to buy a car, let’s look at some of the other things you can expect while in the finance office. Proof of income —To satisfy this requirement, bring your most recent pay stub. It will have your year-to-date income. If you’re self-employed, you’ll need your most recent tax returns (generally the last two years) and your recent bank statements (generally the past three months). Proof of residence —The lender is going to need to verify your address for the loan application, so bring your driver’s license and a utility bill (or other important correspondence) that you’ve received at your current residence. Proof of insurance —You’re also going to need to show you have adequate insurance coverage before you can secure your car loan. If you already have coverage, bring that documentation. Proof or your identity —This may seem obvious, but you’ll need to bring a form of ID with you to prove your identity. This can be a government-issued ID, your passport, your driver’s license, etc. Your credit history —You don’t need to bring this with you; the lender will be able to pull it up at their office. However, it’s a great idea to check your report before you decide to finance so there aren’t any surprises. The vehicle information —If you’re not using the in-house lender at the dealership (example: you’ve gone to your personal bank), you’ll need to bring information about the car you’re trying to purchase. This includes the year, make and model, as well as the VIN number and current mileage. These are the basic pieces of information you may need in order to finance a car. However, if there are any negative aspects of your credit report that you can improve with documentation, bring those as well. For example: if you have great payment history but there’s a period of a few months where you were unable to work because of a medical issue and it caused you to miss payments —you could bring documentation about your medical issue (with dates) as supporting documents. Knowing the credit requirements to buy a car, as well as your overall credit health, will not only help to save you money, it will also make your life so much easier. If you don’t have established credit, check out this article on how to build your credit the smart way. If you have established credit but your score isn’t where you want it to be, there are some tried and true ways to help turn your credit score around in just 12-18 months. If you already signed up for a higher interest rate loan before you understood the credit requirements, it’s not too late. Keep an eye on your score and you may be able to refinance your loan at a lower rate after a good payment history of 6 months or more. To sum it up, cars remain the main method of transportation for the vast majority of US adults — which comes as no surprise. Credit not only makes it easier for you to purchase the things you want, your credit score can also impact whether or not you are approved for a loan to buy a new car. For this reason, it’s important that you understand the credit requirements and that you take the necessary steps to get your credit in shape before purchasing a car. With time and good financial habits, your credit score can improve — and help you land the car of your dreams.